While I’m making some final preparations, you can fill in this simple form to get involved in closed testing of city-building game Ostriv. 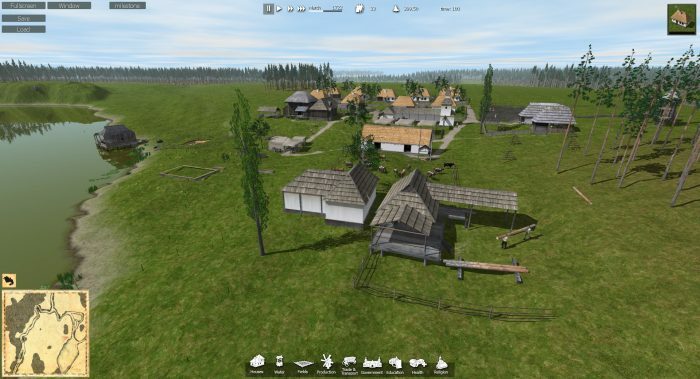 I should warn you beforehand, that this game build is far from final: it works only on Windows, contains only first 23 building types, UI is minimal, some animations are missing, loads of bugs etc. The main goal is to see the weakest spots in the main gameplay decisions and get reasonable feedback particularly on gameplay. As long as it is a closed testing, you can not disclose screenshots and videos to the public. As soon as I’ll get everything ready, I’ll start sending test builds. I think it will hapen in the course of next week. If there’s too many volunteers, probably, not everyone will get involved. I’ll choose based on placement of stars and planets, so try to be more descriptive. UPD Jul 18 2017: testing is now in progress, but you can still apply. I’m approving applications in batches to have always fresh minds when I release new patch. What kind of human you are, names of all your cats, chocolate or vanilla. If we talked before, remind me about it here. Now serious. First of all I need your Windows version, CPU model (e.g. AMD FX-8350), video card (e.g. GeForce GTX770) and amount of RAM. If you have several machines, you’re free to list them as well. Same here. I wonder how many people Yevheniy is hoping for to be testers and how many more beyond that he would accept all together if any at all. He is likely looking users across the board, so low end to high end computers and laptops. This is also a good way to measure continued interest. Maybe should have made my submission more descriptive, but oh well. WOW! Your hard work and dedication is finally about to come to fruition. The game looks awesome- the design style and attention to detail is quite stunning- way beyond anything else currently available and certainly avoids the cartoon look of Cities Skylines. Look forward to the release date, Continued good luck! I expected so much, but this… even in the wildest dreams I would never imagine so much interesting gameplay like in OSTRIV. Surprising is that this is only alpha. If you keep this way of development I think it will be very good game. I am very honored that I can help as a tester. I have got a problem, Tested it out a few times. I build a nice little town, about 50 to 80 people live there. But then Hunger strikes….. People leave the town except for one family thats keeps fishing. So eventually the fishstockpiles are huge, but no new inhabitants come. Can I fix this?